Last week, I completed a three day juice cleanse with A Juicery and it went swimmingly well! At no point during the cleanse was I ever hungry and I finished the cleanse strong. Even more surprisingly, I ended the cleanse feeling satiated with no “brain caving-in” symptoms. A clear sign of nourishment from the juices. Here’s how I got into it. Right before Chinese New Year, someone offered to buy me a a juice cleanse from A Juicery. I must have harped on too happily about cleanses to her. The offer was simply too irresitable for me to refuse. You see, with the longer-than-usual four days CNY celebrations, I knew my greedy self would eat everything in sight. Sure enough, I was right! With all the house visits, plus a quick trip to Penang at the start of the week, I put on an eye-watering 4kg. I almost fainted on the scales. Thank goodness I got the cleanse delivered right after CNY. Right from the get-go, I was dead impressed with A Juicery. They were so professional, energetic and the brand’s pink watercolour scheme so pretty. My heart rejoiced whenever the pastel pink logo popped up. Unlike DJ, this company offered three types of three-day cleanses: Rookie, Fanatic, and Junkie. From cleansing virgins to experienced cleansers, everyone was provided for. The repeated green variety but intense Junkie cleanse was enticing. But the lack of variety and content necessary for this blog led me to choose Fanatic. Three day, eight flavours, eight 400ml glass bottles, bring it on! Immediately upon submitting my choice, I received several emails. This ensured confirmation of my order. At the same time gave me a feeling that during the cleanse I was not alone. Thanks Girls! 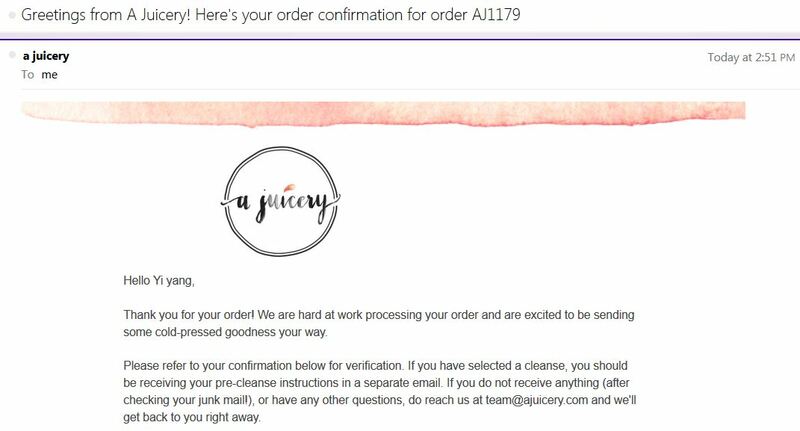 Unlike DJ which delivered the juices daily for the duration of the cleanse, A Juicery delivered all 24 bottles in the evening before the cleanse. If I had a complaint, this would be it: the inflexible delivery option. Delivery was only limited to twice a week. The company outsources their delivery so this could account for the inflexible timing. Furthermore there was only one time slot of 6 to 9pm. This wide time slot meant I got it delivered straight to my home with my intention to drink them in the office. Big mistake. The box of eight 400ml glass bottles of juices was heavy! Imagine lugging them to work every morning. A huge chore. Plus much to the chagrain of my Mum, the three boxes took up a lot of fridge space. My Mum was only too elated to see a box removed every morning. Having said that, the whole package was just so pretty. (I can not stop repeating that word. You will also see a lot of it below too.) The shade of pink was just so endearing and feminine. The branded-on-all-sides rectangular box made me want to open it and examine the contents immediately. With the order of boxes clearly labelled, I opened to find a silver cooler bag containing the juices with the oh-so-pretty A Juicery sticker enclosing the bag. At the side of the first box was a brown envelope containing three *pretty* cards and three bags of Clipper Camomile Tea bags. 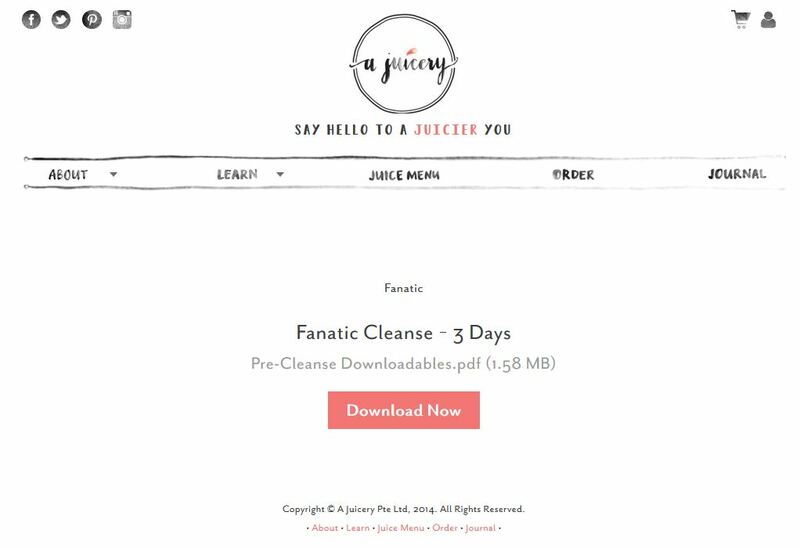 The double-sided cards contained pre and post-cleanse instructions, how-to guide for cleansing, how-to care for the juices, as well as detailed ingredients and purpose of each juice. With all these detailed care instructions, I felt secure and ready to get juicing! Unwrapping the silver cooler bag, I was delighted to find all the bottle caps labelled in sequence. Awesome! I ain’t gonna get lost with the juices in my hazy-non-solid-food state. Plus the glass bottles were fad! Although heavy, they were sturdy. I filled them with hot herbal tea in between juices. Dr. Green Tonic – Oh yuck! The greens were deceptively strong. The flavours failed to compliment each other so this was least appetizing drink. It was also easy to forget apples and lemon were included. I had a tough time with this flavour. Marmalade Skies – First-sip magic! The drink may be bright orange but tasted more pineapple than carrot. I was floating on a cloud of juicy happiness throughout this drink. Definitely my second favourite drink of all. Smells like Green Spirit – The taste of fruits was strong and the coconut water aftertaste was incredible! My only complain for this drink: not enough! Never Miss A Beet – You can’t have a juice cleanse without beetroot. It’s detoxifying power ensures at least one drink will be beet-based. A Juicery’s take is to complement the root vegetable with the surprising additions of Kai Lan, Pear and Pineapple. The result was beautiful. Who knew Beetroot and Pineapple go so well together?! I thoroughly enjoyed every sip of this drink. It also helped that the colour was a **pretty** purple. My favourite drink of all. Evergreen Potion – Strong celery taste – this was an acquired one. I was surprised by the lack of aloe vera or orange flavours. Devoid of any sweetness, this drink felt super clean. One of the biggest difference with A Juicery from the other companies is its use of Asian vegetables in their juices like Bak Choy, Sweet Potato Leaves, Kai Lan and Chye Sim. Usually western vegetables like Kale and Spinach will be commonly used. But A Juicery drinks were more fusion. Western and Asian vegetables were paired with largely positive results. Kudos to A Juicery for recognizing the similar benefits of Asian vegetables. The presence of these vegetables made a huge difference to the taste of the drinks. For one thing, they were stronger in flavour. This made the green juices taste outrageously green. Like if you want to be part of the #eatclean movement, these juices were made for you! I had no problem with them. I liked the grassy notes. Compared to DJ, A Juicery’s juices were appreciatively less sweet. When one begins with DJ’s Barnie and Krypto, a sore throat would inevitably creep in from the sweetness. Not for A Juicery’s offerings. Hints of bitter notes were more discernible with their green juices. It was definitely refreshing! Even the perennial favourite nut drink at the end of every juice cleanse, Coco Cloud, was noticeably mild in sweetness. This was surprising as Coconut Sugar was listed as an ingredient but it was hard to recognize when drinking. The less sweet aspect meant the coconut meat was more distinct. At first sip, the “blandness” took a while to get used but the coconut aftertaste was addictive. I wanted more! 400ml was definitely not enough. Another noticeable difference with A Juicery’s cleanse is the quantity. Eight 400ml juices works out to be bladder-bursting 3.2 litres of juice. On my first day, I could not finish more than five bottles. But this could be partly due to my unusually busy day. However at the end of the cleanse, there were five bottles left unfinished. On my first day, I cruised through the cleanse like a detox warrior! I was floating blissfully at work. With all the liquid, it was hard to get hungry. At the same time, in between the juices, I was downing water and green tea like no other. This only reiterated the point that our body needs a lot more water than we need. At the end of the second day, I notice a brain fog settling in. I knew this fogginess. When my brain lacks fat, this will inevitably set in. My energy was also lower than my usual-hyper self. But I have to admit, this was great! I dealt with low moments at work with so much ease. I just keep smiling and floating on a blissful cloud of juices. On the third day, I awoke to find the brain fog setting in more heavily. Even after two glasses of water, it would not go away. I had to pop in two iron supplements. My energy level increased measurably. Towards the end of the day, my energy remained constantly high. I did not even notice the end of the day. Even at the very next day, instead of waking up to usual post-cleanse-hungry-savage-self, I was calm and satisfied. Woah, what a remarkable difference! Overall, I really enjoyed this cleanse experience with A Juicery. While the packaging and branding were heart-melting, it was the overall positive effect of my body during and post cleanse that I would return to the company for. Thanks Girls for the job well done!